The 18th century cemented the practice of the European Grand Tour among the English upper classes. Privileged young men (and a few women) were encouraged to spend time in continental Europe, particularly Italy and Greece, and thereby soak up the aesthetic influence of the founding European civilisations. One of the most obvious outcomes of this aesthetic influence was the pronounced trend for neoclassical architecture in England at the time. The concept of the Grand Tour persisted into the 19th century, but with a number of significant differences from the original template. First, it became gradually dominated by American travellers revisiting their ancestral homes; secondly, more women participated; third, in England, it was no longer the sole preserve of the upper classes - now the aspiring middle class staked its claim. 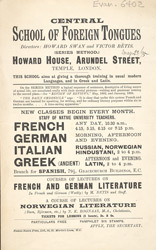 This leaflet advertises courses in "foreign" languages, including French, German, Italian or Greek. There is even a course in Norwegian literature, which was then very much in vogue. The plays of Henrik Ibsen were first performed in English translation on the London stage in the 1890s, and the early novels of future Nobel prize-winner Knut Hamsun had just been translated.